Were the instructions easy to follow? This is a really easy pattern and really good for a beginner who wants to try a Vogue pattern. What did you particularly like or dislike about the pattern? Well, I think I am the last person to try this pattern, lol I have had it on my "to-sew" list for a while and I finally got around to sewing it. I really love this dress because I like when patterns have surprise construction details that you don't see in the picture. I like the dart at the shoulders and that the skirt wraps from to back with o side seams, clever. Pattern alterations or any design changes you made: I sewed it without making adjustments but when I tried it on it was big on the sides and I didn't like the loose look so I had to take it in a good 1.5" on both sides! Would you sew it again? I might make it again in black just so I can have an easy to wear black dress in my closet. Labels: american eagle, DIY, mimi, mimi g.
Lovely as always! That green looks great on you. Be ashamed of yourself - that thing is beautiful. And no you are not the last to make it cause I haven't made it yet either. But I must, I must. The color you chose is so wonderful, and how did you ever think about pairing it with a jean jacket. Never would have thought of that - wonderful! LOVE it! The cowl is so pretty, and I really like green. This dress is gorgeous I love the leopard belt you look stunning!!! 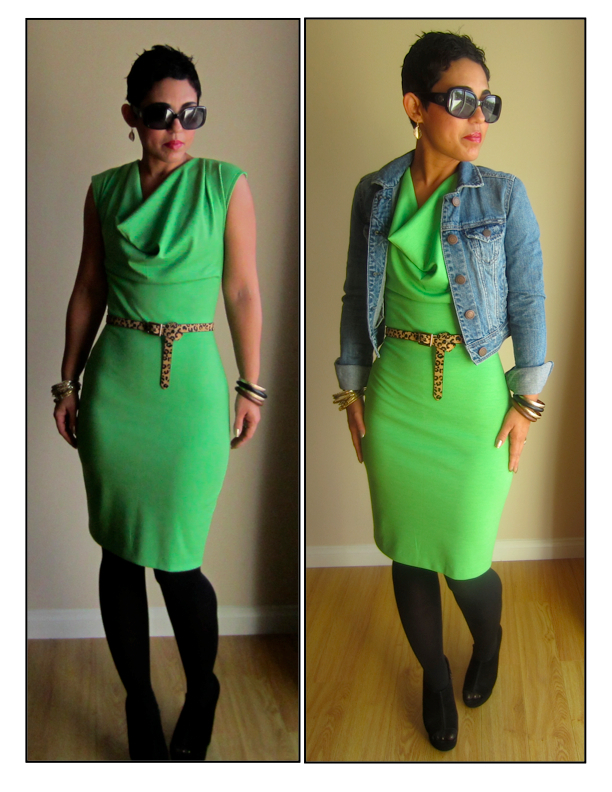 I love the lime dress. Your hair is beautiful. What products do you use? Gorgeous Mimi, just absolutely gorgeous!!! I am excited to make this dress. I just cut it out! Unique color choice, and it works well! I decided that it's high time I got around to making this dress too. You mentioned that you took the dress in 1.5 inches on each side. Please clarify exactly where you did this at. I thought the dress did not have side seams below waist. Or is the waist the area that you took in the 1.5 inches? P.S. I'm going to hold out on cutting the fabric until I hear from you. Thanks in advance for your help! you are correct there are no side seams all the way down they start under the arm and blend into a dart. I took it in from the underarm up to that dart that ends just below the hip. Thank you Mimi - I was a little confused. Add me to the list! I haven't made it yet either and I have the fabric and the shoes! (no excuses!) I'm on it! Luv the green!! Do you sell your creations? Can I buy that dress? Great style! 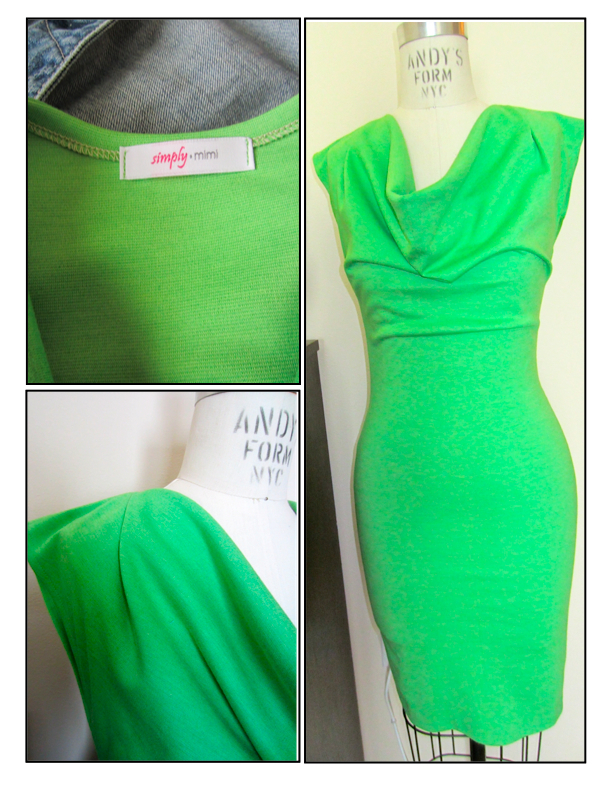 Mimi I love this green dress and would love one for summer! Could I be cheeky and ask you if I could pay you to make me one? I am new to your site. I can't remember how I came across your site, but I am addicted to your blog!! LOL!!! Your style is impeccable. You definitely inspire me to continue improving in my sewing. I have made a few things, but I am not the best at measuring to my size very well. I use some of the clothes in my closet to get an idea on how I want something to fit me. I saw that you started with that in the beginning as well. THat was inspiring. Anyhow, I love this green dress that you made. I am currently a plus-size gal, but am trimming down and this is the dress I would love to make for myself. 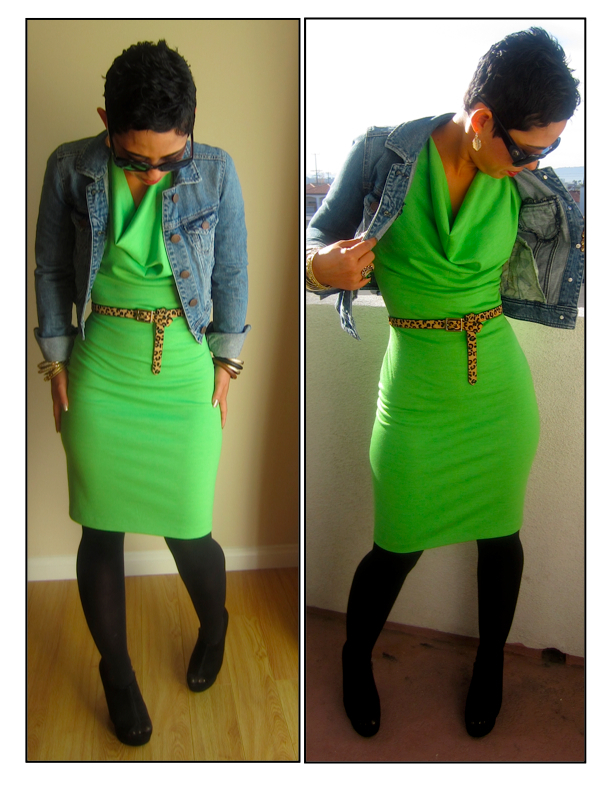 I wonder if you could make a dress like this with color blocking or something too. Please keep the info coming. You Rock! I've had this pattern for a while now and could not figure out what type of fabric to purchase. THANK YOU! I can't wait to make this dress! I also love that you made this dress stop below the knee. STUNNING!